As the U.S. dollar has gained strength against global currencies in recent years, lower import sales and cheaper foreign printed circuit boards have created shifts in this industry. In the United States, about $4 billion in revenues are generated by the PCB industry each year. Since 2013, however, the industry has seen a -2.7% annual decline in revenues within the U.S. market. Although manufacturers provide about 21,000 direct employment opportunities in the U.S., fewer than 500 firms are now active in this industry. The PCB industry in China is a very different story. The industry there earns revenues to the tune of $95 billion per year. Since 2013, it has seen an annual growth rate of 8.4%. About 2,500 firms are active within the Chinese segment of the PCB industry, creating about 700,000 direct jobs. The PCB industry may have seen steady declines over the past 5 years, but times are changing. With three-month rolling averages for orders and sales having a book-to-bill ratio greater than 1, this indicates that demand is greater than supply. That is an indicator that future growth is likely. Although semiconductor sales for the industry peaked in Q4 2017, the indexes have been in positive territory for the last 24 months. There is also a 3/12 rate of change for new orders in the United States for electronics, which continues to push sales upward and keep the industry strong. Strong orders from China will continue to boost the global industry as well, with 2018 offering 7% growth for the market by itself. Although the printed circuit board industry works with mature markets, it also provides the fuel for innovative new electronic products. 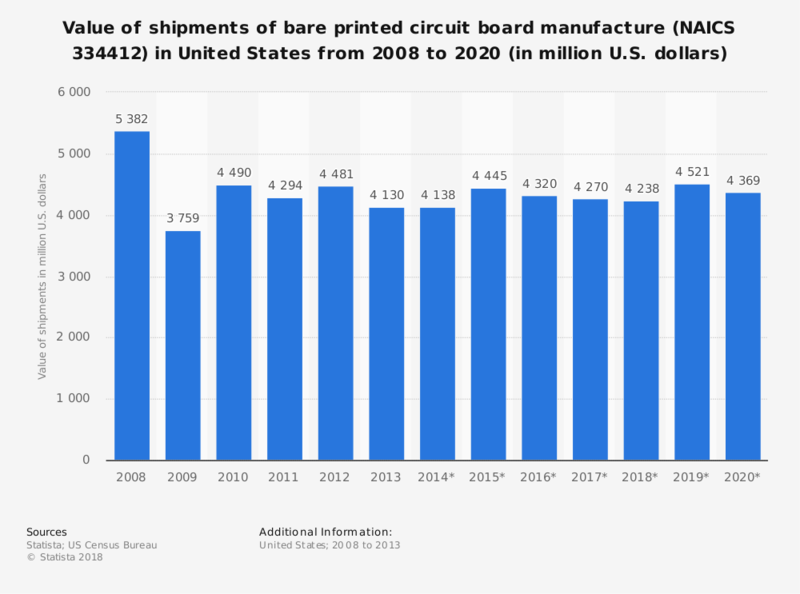 Continued innovation in the equipment and manufacturing services sectors for electronics will keep this industry growing in the next 5-year period, with total values forecast around $70 billion for PCBs.